The MSBA Veterans’ Affairs & Military Law Section bestowed its 7th Annual Brigadier General Philip Sherman Award upon retired Prince George’s County Circuit Court Judge C. Philip Nichols, Jr. during a special ceremony held May 17, 2018, at the Fifth Regiment Armory in Baltimore. 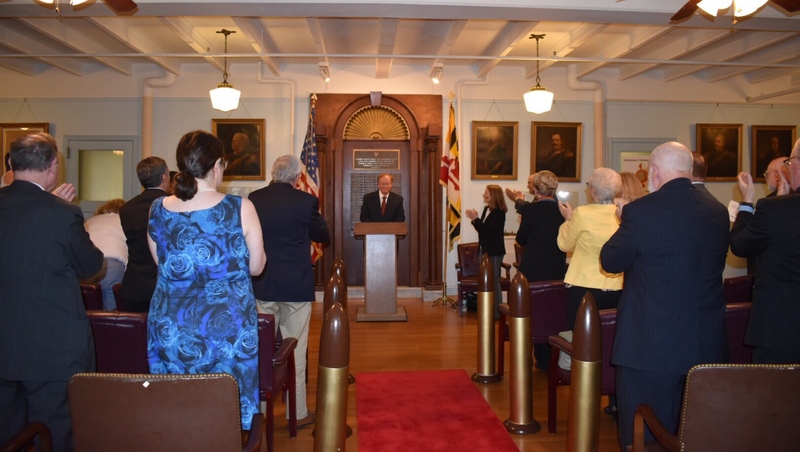 Last year’s Sherman Award honoree, Baltimore City District Judge Halee F. Weinstein, presented the award to Nichols before an audience of approximately two dozen attorneys and judges. Special guests included Swapna Yeluri, Esq., who provided background information on the award, and keynote speaker George W. Owings III, Secretary of the Maryland Department of Veterans Affairs, and Section Chair Hugh McClean.